date on what happened during the last couple of days. And the most important thing was probably the towing test. 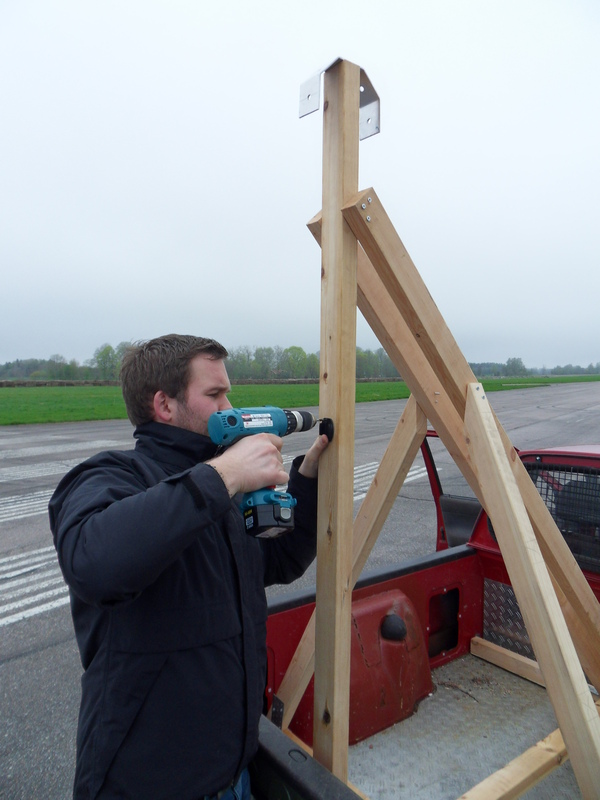 On Wednesday last week more or less the whole team gathered to do a drag test at Tierp Airfield a bit north of Uppsala. 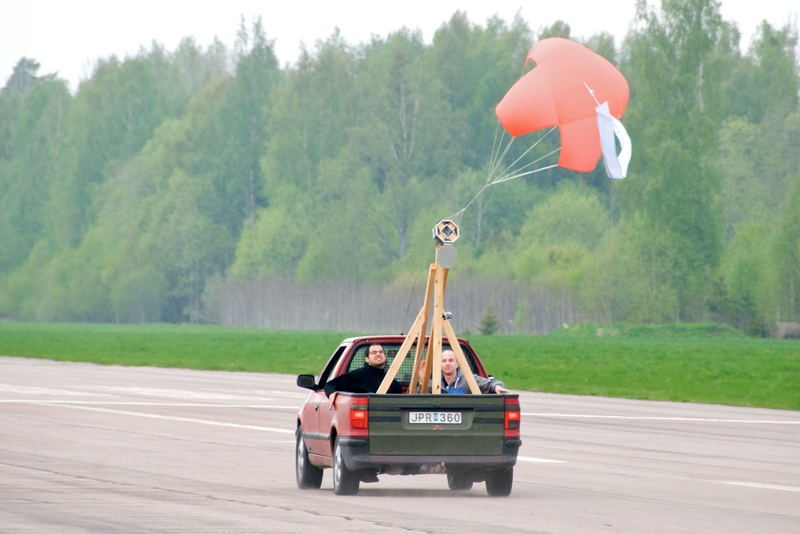 The goal of this test was to investigate the deployment of the parachutes and to find a working folding technique. In order to be able to do the test we all had a busy Monday, Mario and Gustav built a rig to mount the FFU onto the car and I had to produce something to attach it in different angles. Unfortunately the mounting device from bent aluminium wasn’t as stable as I expected it to be. However, after some starting problems with broken swivels and opening problems a couple of runs worked out quite well, the chute deployed when it was mounted with the attacking wind. The two tested folding techniques seem to work equally good and parachutes seem to work fine. Back in April, David and me from SQUID and Johan and Erik from LAPLander headed out to Barnens Ö with Nickolay. It’s an island some distance from Stockholm, and in the summer it hosts camps for kids from the city. This time however, it hosted a camp for kids interested in astronomy held by the Egna Vingar foundation. We went there to talk about our projects, while Nickolay talked a bit about space weather. We got a lot of appreciation, and were even asked if we could come present more in the future. 😀 We also met a fellow space-blogger, Frida. Visit her blog at Frida och Stjärnorna (in Swedish)! Erik had built two model rockets for the event, and we saw it as a great opportunity to try out our little shock-proof HD-camera. I’ve had the video for a while, but I thought it was high time I uploaded it! The second rocket has an absolutely huge motor, and it was a pity it was so foggy. 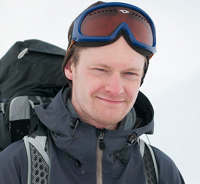 Erik estimated it might’ve reached an altitude of a 1000 meters! Last week our motors for the SCALE system was finally delivered. As many of you may know I’ve been rather involved with trying to get our motordriver to work. At first we made a first version which we after some weeks of testing and tuning finally got to work. However during the tests we noted that there where plenty of parts in the circuit which could be simplified. So after some final test, that proved that the first version worked with a similar motor to ours, we decided to make a new version. 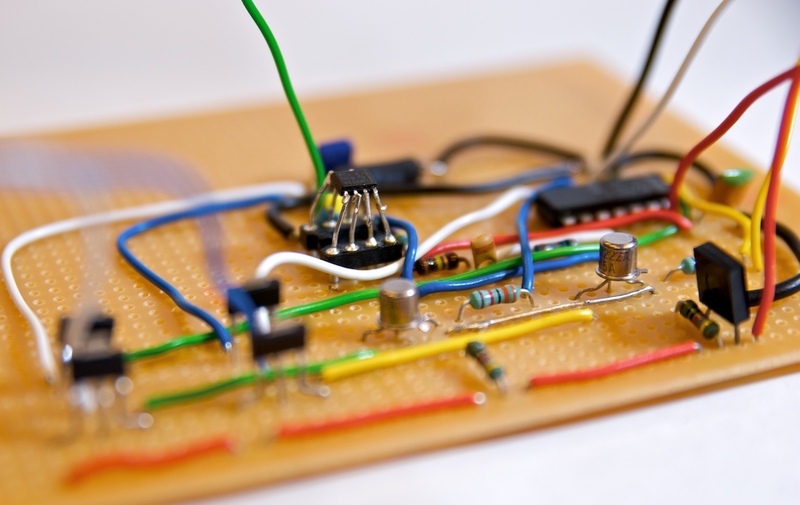 The new version in its turn where acctually quite delayed mainly becaus a simple mistake when reading the specification of the comparator used in the circuit. About two weeks ago I finally made it work, just in time for the delivery of the new motors. So now we’ve tryed the motors both with the new driver, proving that it works, as well as with the older version of it, which we have in two copies enabling us to actually run the motor since it makes use of two motors. Congrats to the mechanic team they are doing a great job in the workshops and impressive CAds. 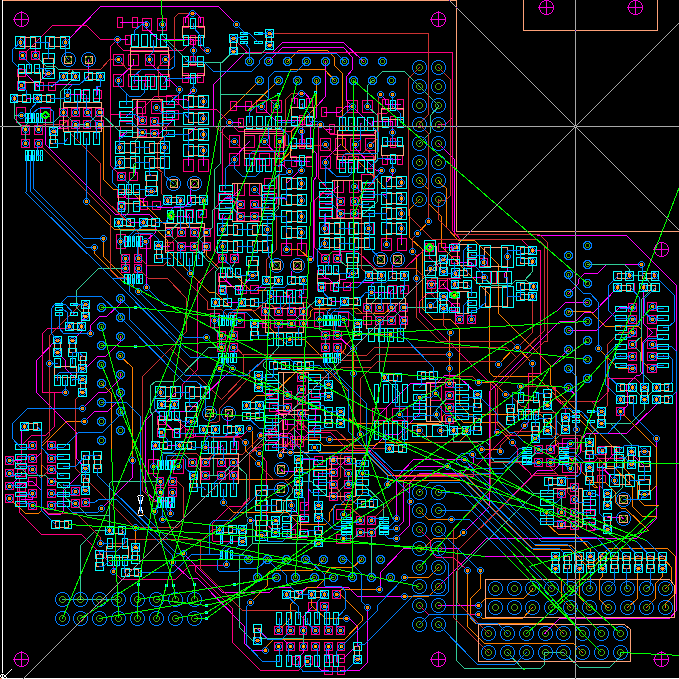 In electronics we also have advances, finally we defined the number of PCBs we will use, as well as their position inside of the ebox, we spend quite some time defining the interconection between the boards. 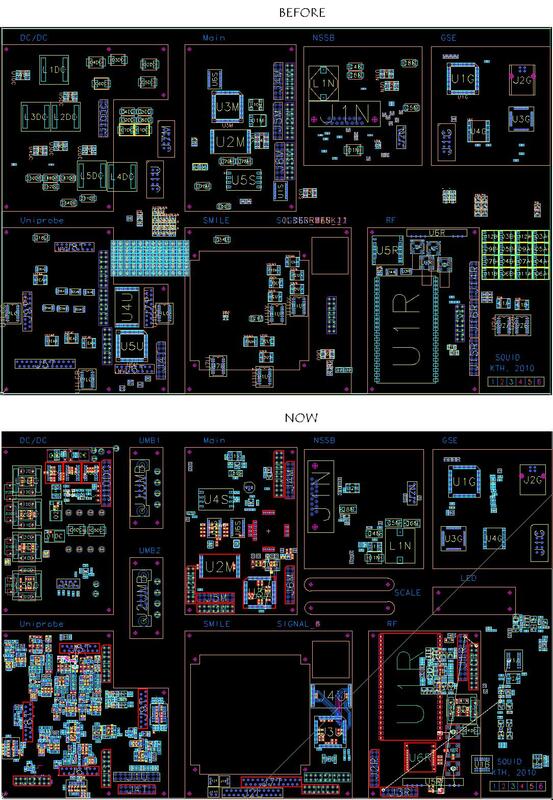 Once the design of the SCALE system was finished we were allowed to locate the position for connectors to external world and antennas for GPS, Satellite transmitter and Radio beacon. But definitely Nickolay, Mark and me have spent many hours in the placing of components, some boards are very populated and the routing becomes a bit tight, but we can see the difference in the boards and now they look just amazing!… lets wait for the soldering it will be very funny, fortunately next month Gustav will take a course of soldering in ESTEC (European Space Research and Technology Centre, Noordwijk, The Netherlands) and I will take one in DLR (German Aerospace Center, Oberpfaffenhofen,Germany), although we have been practicing a lot I think the courses will be very good to make it perfect!! …. 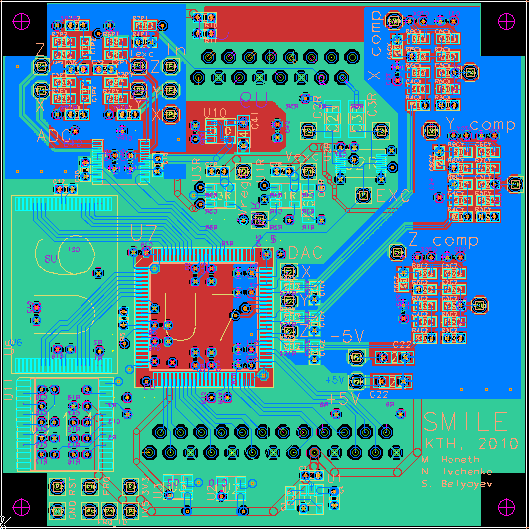 But not everything has been schematics,layouts and soldering…many things are running in parallel, we count now with a new member Linus, he is helping a lot with the camera circuit to control it. Gustav is working with the umbilical connector, doing tests and concluding the design. 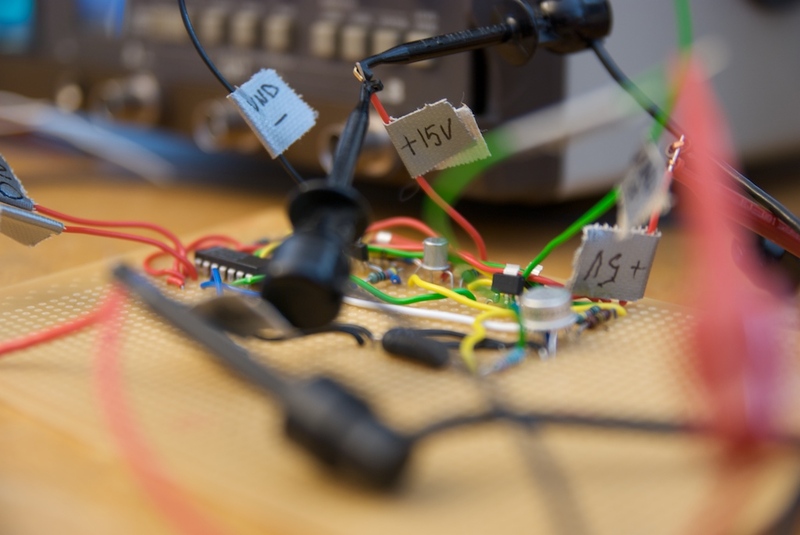 Also I am preparing tests for the ADC of sphere circuit. And last but not least, the software is coming along with the tests. So, we all have plenty of tasks but when something is working it feels just great!! 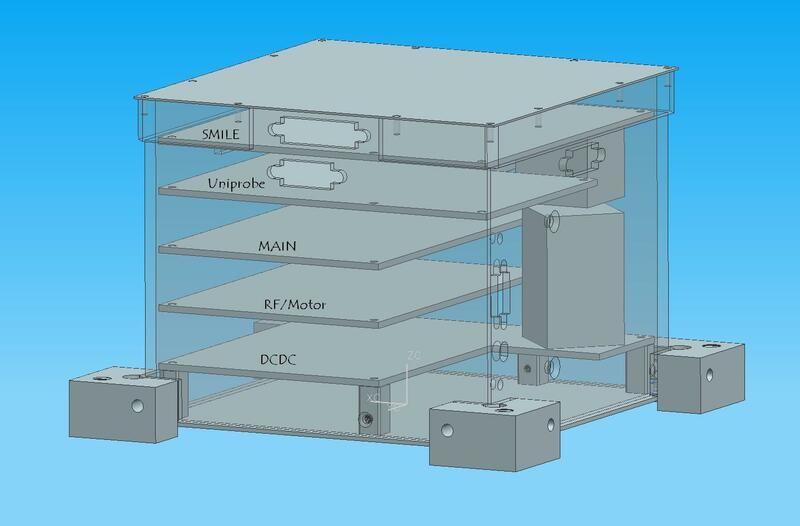 The main objective of the SQUID project is to develop and test a relatively cheap plataform for the study of the earth electric and magnetic field. 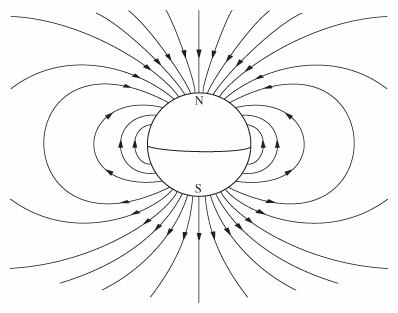 We have all seen a lot of times the typical image of the earth as a magnetic dipole (the earth with a magnet inside, with the magnetic field lines comming from the south pole to the north pole). However, the sun is constantly releasing plasma (called solar wind) which has its own magnetic field. When the solar wind arrives to the earth, it deforms the eartsh magnetic field giving it a tear shape. The solar activity is very variable, and the intensity of the solar wind is changing constantly. The sun has a 11 year cycle, in which its activity changes from low activity (right now we are on a “quiet” period of the sun) to high activity. A higher activity involves a higher number of violent phenomena happening on sun, such as solar flares or CME’s (Coronal Mass Ejection), which produce a sudden and violent increase on the solar wind speed and plasma density. When this “high density” plasma reaches the earth magnetosphere, it deforms it, inducing a so called magnetic substorm. These phenomena are extremely complex and there is a lot of research happening on the scientific comunnity to investigate and explain how they work. One of the most known phenomena induced by the magnetic substorm are the auroras. 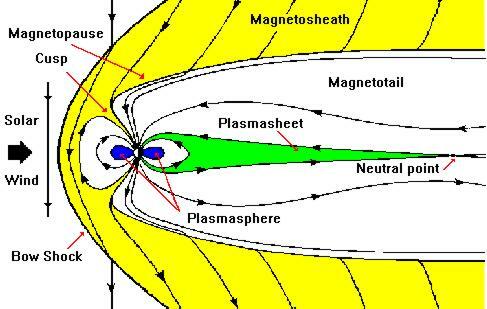 When the high density plasma reaches the magnetosphere, it flattens the magnetotail, in such a way that magnetic field lines with opposite directions touch each other, inducing a phenomena called magnetic reconnection. When this happens a big ammount of plasma is ejected from the reconnection point towards the north and south poles at an extremely high speed, and when this plasma “falls” into the atmosphere auroral activity occurs. Auroral activity occurs at altitudes above 100km, and those altitudes are “easily” reachable with sounding rockets, making squid be a very useful platform to provide useful scientific data to learn more about our magnetic field.